To fully enjoy a perfectly cooked steak, you need the proper utensils. Most steak lovers rave about the sleek look and smooth slicing of Berti Plenum Steak Knives. Berti Plenum Steak Knives are sculpted in 420B stainless steel and shaped like straight paring knives with bolster for extra control while cutting. Instead of tearing into your steak like a serrated blade Berti knives slice each bite beautifully. 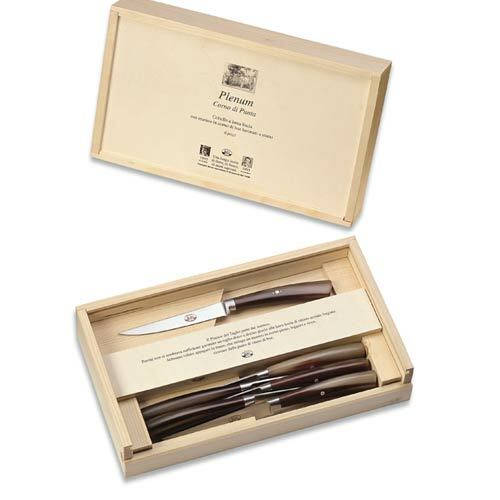 Berti Steak Knives improve your eating experience and give your family something to treasure. To date, Berti Knives are made in the tradition started in 1895 and each one bears the initials of the artisan who personally crafted them. Tang- refers to the portion of metal that extends from the knife's blade into the handle. Full Tang- are considered the sturdiest, as the blade's metal extends through the entire handle. The tang is secured with 3 rivets. Anchored Tang- also considered to be strong, anchored tangs are glued and no rivets are used.